Amir Minai [pronunciation Ameer Meenai], who was born in 1828, is among the classical master poets of the Lucknow school of Urdu poetry. His name was Amir Ahmad and came to be known as Amir Minai in literary world. 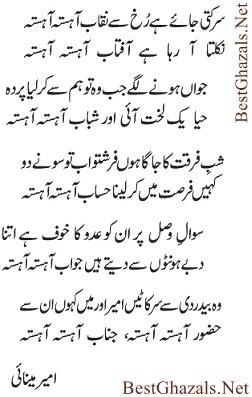 Amir was a contemporary of Dagh Dehlvi. He is known for his perfection on the ghazal genre. Amir Minai passed away in 1900.